Rich Maines is one of the faster mountain bike racers in Arizona. The guy absolutely flies on a singlespeed. Even better, Rich makes a strong case for me to label him The Most Interesting Mountain Bike Racer in the World (stay hydrated, my friends). Why? Well, he combines cycling with travel. 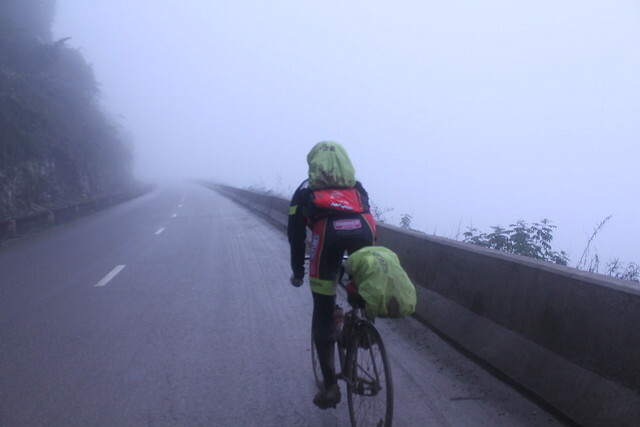 He blogged in-depth about a four-day cycling tour of the mountains west of Hanoi, Vietnam – Hanoi, Son La Province, Phú Yên Province, Tam Đảo – in March. I really admire this since Rich is a local rider, not a superstar in the Hans Rey sort of mold. He’s a regular guy who went out on his own to craft a cool Hanoi bike tour adventure – and he succeeded by any measure. Rich logged 27 hours of total ride time, 370 miles and 22,913 feet of elevation gain during his tour. He also encountered buckets of rain since March is the rainy season. Rich got his share of awesome views – sugar cane fields, rice paddies, banana treas and enough fields of tea leaves to keep America awake until the next ice age. The route had more hills than Rich expected … which led to some challenges on a singlespeed, fixed-gear road bike. Judging from some of the photos, a mountain bike would’ve been at home. “I just figured I’d walk what I couldn’t ride. If I couldn’t hit all the planned destinations, no worries, I was there to see the beautiful surroundings and enjoy the experience,” Rich says. Rich’s trip proves the power of the bicycle: Local kids were eager to greet the strange Westerner pedaling through the mountains. He had no shortage of offers for food and invitations to stay and visit. You can – and should – read more about Rich’s racing and riding adventures at his Rich Maines – Endurance Mountain Bike Athlete blog. Just prepared to be jealous since he’s sponsored by cool companies like Ergon, Stan’s No Tubes and Hammer Nutrition. Very cool indeed.. Adventure is in the Maines spirit!